World's Largest Hammer: Sort Of WTF Do You Do With A Mini Hammer? 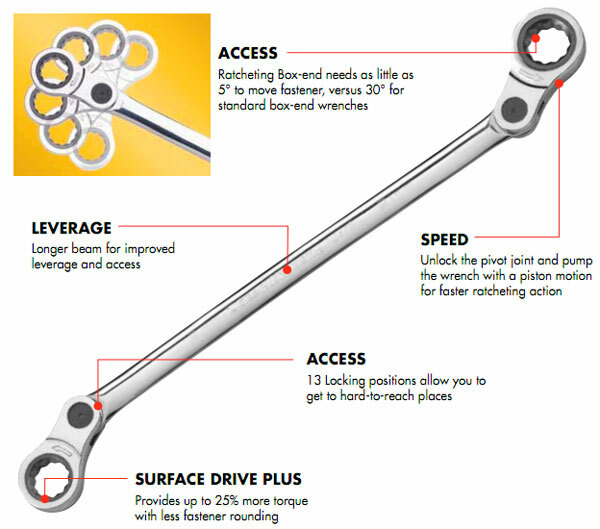 The idea of an indexing box-end — complete with GearWrench’s well-known fine-toothed ratcheting system — makes a lot of sense. Believe me, there’s nothing more frustrating than trying to get at a damn bolt or nut that’s just a little bit off from any angle you can possibly reach with a straight wrench. (Pick yourself up a set of deep offsets, too.) But hey, GearWrench’s double box-ends go to 11, man. Both ends index. As you can see in the infographic above (courtesy of GearWrench, of course), you get 13 locking positions. This means that rather than simply flopping around like a some similar wrenches, you can lock this one in place, stick it down in the engine compartment, pull it back out and move it over a notch or two, and repeat until you can finally latch it on the buried fastener. GearWrench has been great about including this kind of indexing system on almost all their special-access tools, which simply rocks. Other than their 13-year-old-gymnast-like flexibility, they’re pretty much just standard box-end ratcheting wrenches. They’re sold individually or in a single six-piece set with six size combinations: 8 and 10 mm, 11 and 12 mm, 13 and 14 mm, 15 and 16 mm, 17 and 18 mm, and 19 and 21 mm. Expect to pay around $80 for the set or around $30 apiece for open stock wrenches. And if you want to see them in person, it’s a fair bet you can find them at your local Sears. Add a couple more lockable pivots and you could make a “Starter Wrench”! Both are made by Apex (Danaher). I don’t know if the Matco set is made in USA, but the Craftsman is not. A second look says the Matco IS made in USA. Nice. Here’s a Sears ad for their indexable ratcheting wrench sets, which they call ‘elbow’ wrenches: http://www.youtube.com/watch?v=fdPQIZp4zXY. They are the same tools as the GearWrench items. Gear Wrench is owned by Danaher. They are a quality tool manufacturer much like Snap On. They don’t make junk.Sears starting marketing this brand several years ago. I have dealt with them on a professional level and they are still like what many American companies once were. For many years much of the Craftsman line of sockets and wrenches seem to have come out of Easco tools (as in K-D Danaher) made in the US. Old post however just to correct, GearWrench is owned by Apex not Danaher. Danaher only produces tools Made in USA, Apex imports. Metric only? eh. Never Mind.